By taking a number of simple precautions when using your agricultural machinery, the incidence of bush fires and spot fires can be dramatically reduced. This will ensure machinery does not overheat, and subsequently prevents fires from starting. Australian Pump Industries provide a range of high pressure cleaning machines that effectively remove excess dirt and oil from agricultural machinery, including water blasters, triplex pumps and steam machines. In a press release issued by The Rural Industries Research and Development Corporation (RIRDC), Dr. Graeme Quick explains that it is a good idea to invest in a handheld infrared thermometer and to use it to regularly check the temperature of bearings, brakes and so forth so action may be taken prior to overheating occurring. The material can light on fire quite easily and drop onto the ground, which can cause spot fires that may quickly escalate into bushfires if no firefighting equipment or water source is nearby. 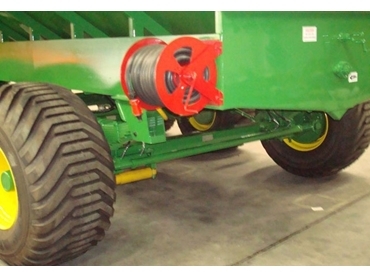 Trufab Farm Machinery has developed 800 litre fire fighting kits for use with chaser bins. They can be attached to the company’s chaser bins, along with those manufactured by other companies. A 5.5hp stationary petrol engine. These fire fighting kits ensure your property is protected as they ensure water is always on hand, which ensures spot fires are contained quickly and effectively. When you relocate from one paddock to another, it is vital that you take the appropriate fire fighting gear with you.On a hot, busy, stressful day this may be forgotten. Thankfully, because these fire fighting kits are attached to chaser bins they will never be forgotten, and the safety of you, your employees and your property is guaranteed at all times.